The Toyota Corolla that I was recently able to test came in a pleasing Electric Blue Storm metallic color and featured gray fabric seating surfaces. 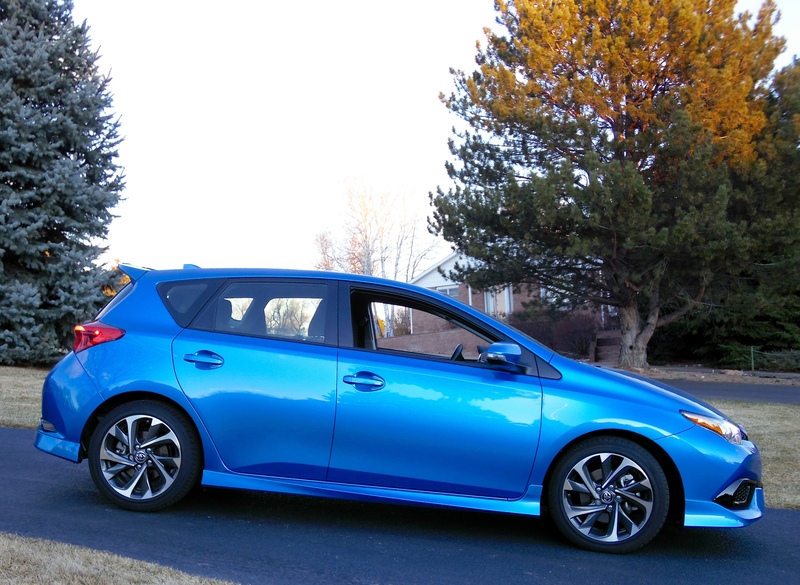 I enjoyed the Corolla iM (Toyota’s version of the now-defunct Scion iM); it provided spirited acceleration, and gas mileage came in at nearly 33 mpg in all city driving. 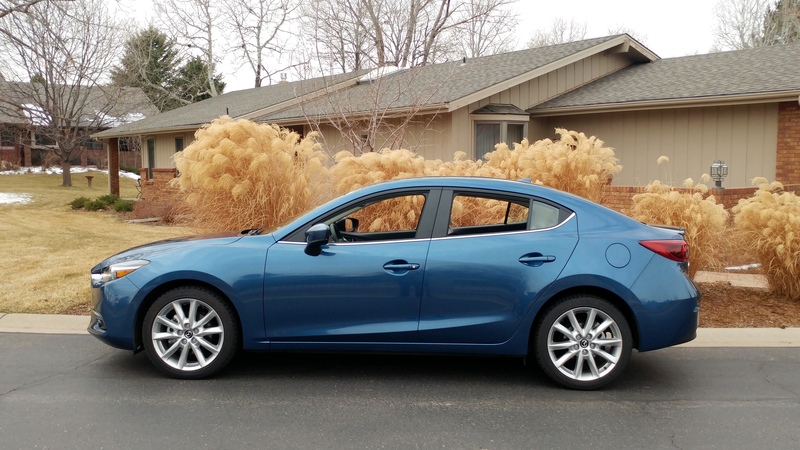 The way that Greeley has grown, it seems you are always poking around looking for parking space, so with a car that’s 170 inches long and 69″ wide, it is not too difficult with Toyota’s Corolla iM five-door hatchback. The Toyota Corolla, the best-selling nameplate of all time, has moved over 40 million cars onto driveways around the world (well, mostly driveways). The car is in its eleventh generation configuration, and has been around since 1966. The 2017 iM sits on a 102.4″ wheelbase, is 69.3″ wide, 55.3″ high, and weighs 2,943 lbs., putting it on an even keel with Chevy’s new Cruze hatchback. I’ve always been a fan of Corolla styling, and this 2017 iM has not taken a step backwards in that department. LED lighting was front and rear, including front daytime running lights, and fog lights were installed. Silver and gray ten-spoke alloy wheels were fitted with P225/45R17 all-season radials on the car. I mentioned acceleration – it was acceptable for a 36 mpg car, and other driving dynamics were good, as well. They use, among other things, electric power steering to effect that highway gas mileage rating, as well as Valvematic technology on the 1.8 liter, 4 cylinder engine. It puts out 137 horsepower at 6,100 rpm as well as 126 lb. ft. of torque at 4,000 rpm. The front-wheel drive car gets 28 mpg in the city and 31 mpg, combined, and for me the reading was 30+, all week long (14 gallon tank). Toyota’s choice for a transmission is the continuously variable (CVT) automatic with shift mode. The interior of the iM was comfortable for Ruth and I, and the seating was supportive and looked good. 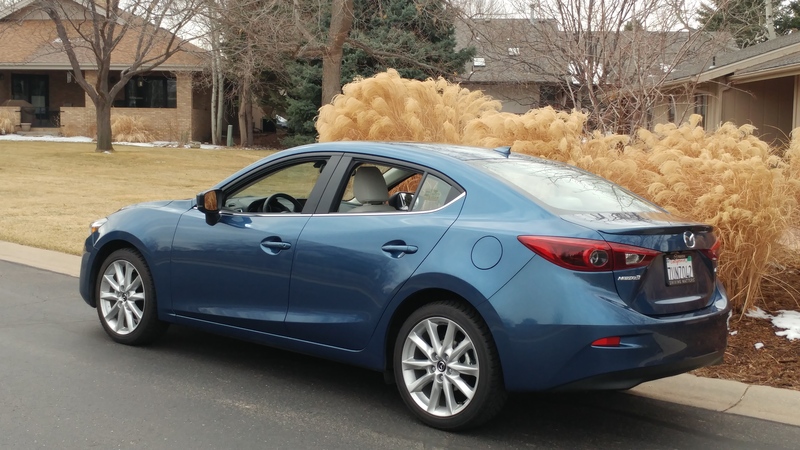 The car had Toyota iM Display audio, backup camera, 7″ touchscreen, cruise control, power windows/locks/mirrors, AM/FM radio, tilt/telescope, and keyless entry. The rear legroom is suitable for a car of this size, at 32.7″, and the hatchback has 20.8 cubic feet of luggage space behind the back seat. M.S.R.P for my test Corolla came in at $22,498.00, including freight. Options included a floor/cargo mat set for $185.00, paint protection film for $395.00, rear wind deflector for $399.00, computer tablet holder for $99.00, and wheel locks for $65.00, all added to the base price of $19,490.00. The Corolla did a super job for me and during the test in Northern Colorado. The slick styling caught a lot of eyes, the car kept pace at the stoplights, and I spent a nominal amount of money on gas. I’d say it is a good value. Hyundai is a giant South Korean automobile manufacturer based in Seoul and it is the fourth largest such firm in the world. The company owns almost half of KIA Motor Company, as well, and has been in business for 45 years. In North America, Hyundai has designs on becoming the number three automaker by 2020. This last week I had the pleasure of testing a new, 2017 Hyundai Santa Fe Sport 2.0T Ultimate model courtesy of DriveShop, the local press vehicle media concern. The Santa Fe is a midsize crossover that has been around since 2001, and was on the forefront of the crossover boom that started at that time. 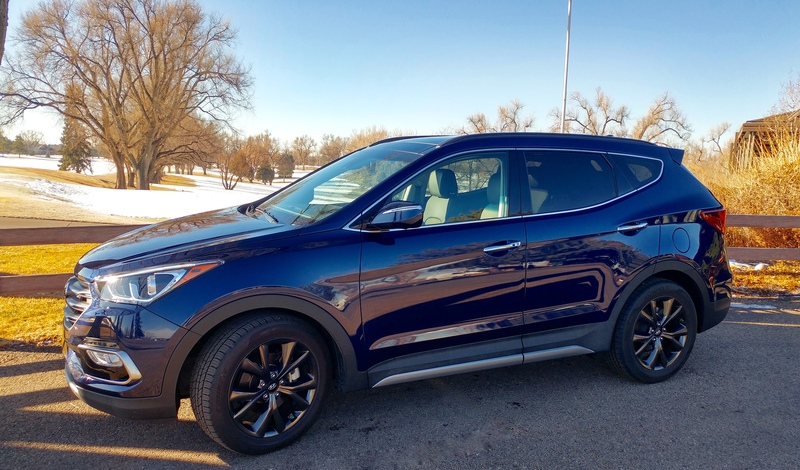 Styling of the 3rd generation Santa Fe is a hallmark of this latest model, and chrome abounds on the car, including a big grill, door handles, and exhaust finisher. 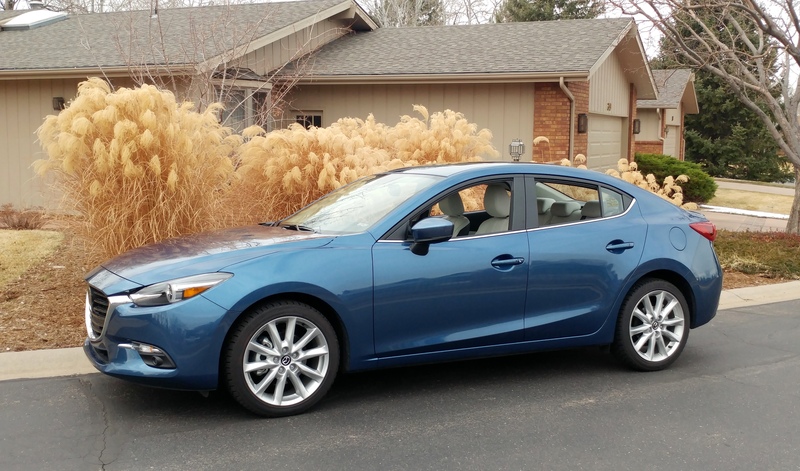 The vehicle was painted Nightfall blue metallic and featured premium exterior lower door trim. 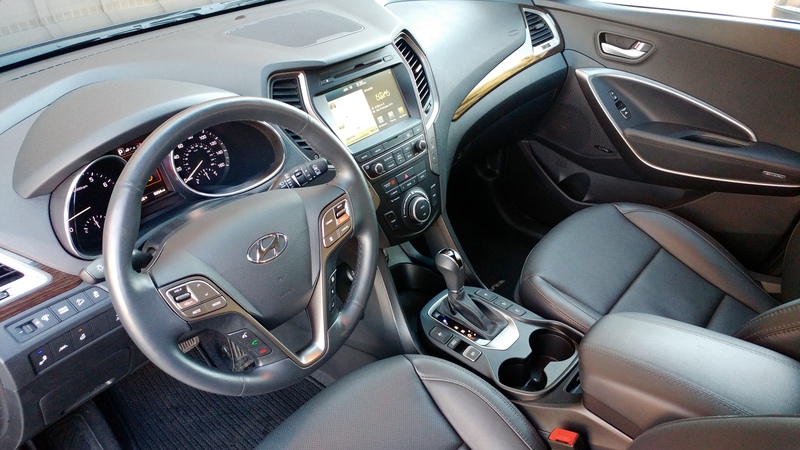 The all-wheel drive Santa Fe rides on attractive, 19”, ten-spoke dark gray alloy wheels. Speaking of abundance, inside the Santa Fe was the Ultimate Technology package along with a panoramic sunroof. The package allow the occupants to enjoy dual-zone climate control, navigation/rearview camera, a 8” touch screen, satellite radio, proximity keyless entry, premium 12 speaker Infinity QuantumLogic surround sound, heated seats (everywhere) and heated steering wheel. The car is also equipped with power locks/windows, tilt/telescope, USB/Ipod connections, Bluetooth capability, HID Xenon bending headlights, auto-open hands-free power tailgate, lane departure warning, overhead multi-view camera system for parking, and radar cruise control. This is an extremely luxurious vehicle – list price with all options and freight totaled $40,820.00. A nice feature also found inside the Santa Fe is a mammoth rear cargo area with 35.4 cubic feet. That expands to 71.5 with the 3-piece split rear seat folded down. That’s right; the rear, sliding bench seat is a 40/20/40 so that two skiers can ride along with their equipment in the middle. Power for the Santa Fe is supplied by a turbocharged 2.0 liter, 240 horsepower, 4 cylinder engine with a 6-speed automatic transmission. The EPA mileage ratings are 19/city and 24/highway (17.4 gallon tank), and acceleration is reportedly zero to sixty in 6.5 seconds. The ride of the Hyundai is compliant and the handling is SUV-superb. Interestingly, the Santa Fe Sport features both Hillstart Assist Control and Downhill Brake Control, items I would have loved to have on my rental car the last time I visited San Francisco. Such amenities are indicative of the value associated with this Hyundai Santa Fe Sport 2.0T Ultimate. The most recent car brought to me for review earlier this month was the 2017 Toyota Yaris. The model was the 4-door iA sedan in Pulse red paint. 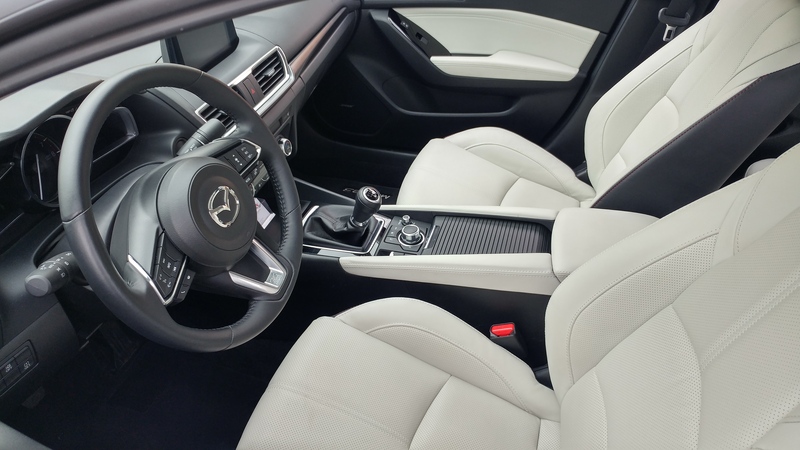 The interior of the car included black and gray fabric with sport front buckets and a 60/40 split fold-down rear seat. The odd name of this car is derived from the word Charis, the Greek goddess of elegance and beauty. And the German expression of affirmation, “ya” is tacked onto the front of the name. It could just as surely refer to the target market of this car, Young Adults. On balance, it is a suitable name, and the Toyota people probably don’t mind that the word looks like the cultural epicenter of Europe, that being Paris. Ruth and I jumped into the Yaris and buzzed over through Loveland for a ride towards the Village Inn. 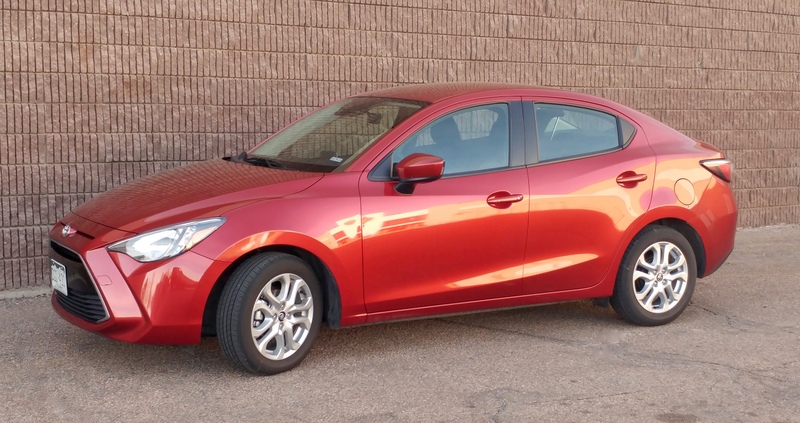 Getting in the car wasn’t particularly difficult, and the highway manners were fine for a subcompact that had a wheelbase of 101.2″ and overall length of 171.7″ With the base price of $15,950.00, adding freight of $865.00 brought the M.S.R.P. to a reasonable $16,850.00, F.O.B. Denver. That last initialism stands for “freight on board,” or in street parlance, “where delivered to.” Standard equipment on the Yaris included 6-speed manual transmission, front-wheel drive, real hand brake, electric power steering/windows/locks, color-keyed power mirrors with turn signals, cruise control, anti-lock braking system, air conditioning, remote keyless entry, CD/stereo with USB and aux. jack, tire pressure monitor, and tilt/telescope wheel. Trunk capacity is ample at 13.49 cubic feet. I was pleased with, and I received compliments on, the styling of the Yaris. Yaris power is provided by a 1.5 liter, 4-cylinder, 106 hp engine with variable valve timing. Torque is 103 lb. ft., and acceleration is OK (zero to 60 in perhaps a touch under ten seconds.) Gas mileage ratings are 30 in town, 39 on the highway, and 34 combined. I observed a reading of 32.5 overall. The styling of the Yaris is fine, with attractive paint and 16″ ten-spoke silver alloy wheels fitted with 185/60R16 all-season radials. On this day the eggs at the restaurant were a little runny, but the ride back was a pleasure and I was proud to be seen in the Yaris. I guess I looked a little old, but Ruth didn’t. Would I let one of our three daughters drive, buy, ride in, lease, or borrow a Yaris? You bet. 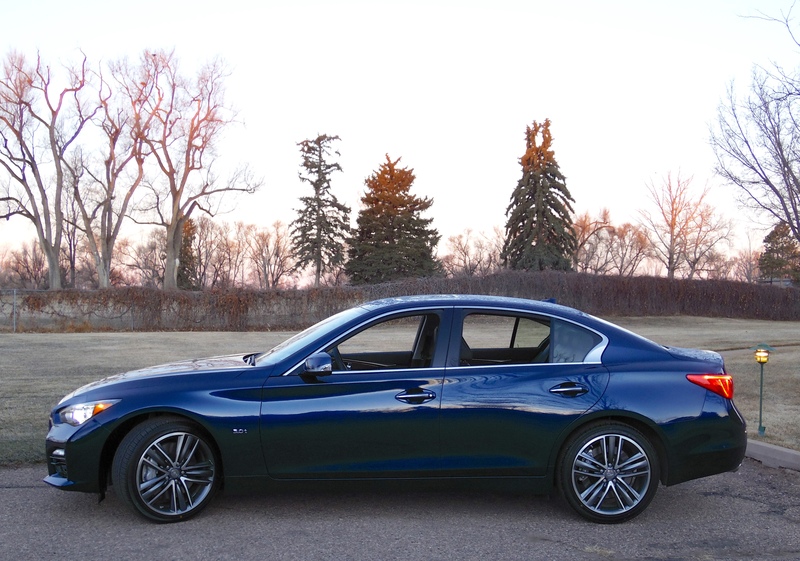 The Q50S is a magnificent machine, with power, looks, and acceleration that is pleasing to the driver and onlooker. The original Honda Ridgeline came out in 2005, and immediately caught the attention of the public, with competitors putting similar vehicles on their drawing boards. None produced anything like the Ridgeline, however, and after 2014 Honda even dropped production. Now the Ridgeline has returned with several improvements and I tested a black one during a recent week. The Ridgeline can tow 5,000 lbs. and carry 1,584 in its 4′ wide pickup bed with a trunk underneath. The tailgate is dual action, the interior is mammoth, and the ride is definitely car-like. A nice car. 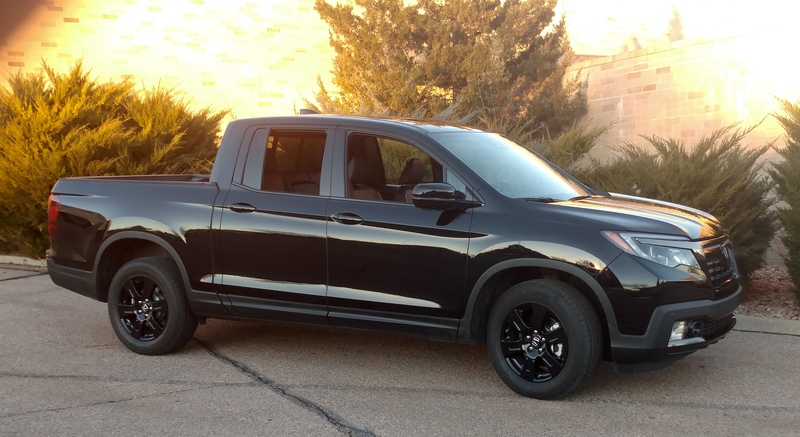 The V-6 puts out 280 horsepower and the transmission is a six-speed in this all-wheel drive Black Edition Ridgeline. The Honda weighs 4,500 lbs. and gets 25 miles per gallon on the highway. It gets my stamp of approval.